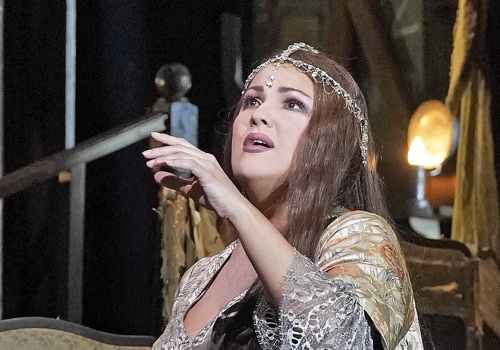 Soprano Jennifer Rowley’s triumphant Metropolitan Opera début as Musetta in La bohème inspired universal critical praise, with The New York Times raving that she “made a splash […] maneuvering flirtatiously through the crowds and singing with a vibrant, agile voice.” Review after review commended both her voice—described as “dark and rich but also extremely flexible and clear” by ConcertoNet—as well as her fine acting. The New York Observer admired the “gravitas” that she brought to the final act, saying, “Usually, we have to take the character’s heart of gold on faith, but Ms. Rowley took the trouble to enact it.” This season, Rowley sings the title role in a semi-staged production of Samuel Barber’s “heart-breaking family drama” Vanessa with Toledo Opera and returns to The Metropolitan Opera for their productions of Cyrano and Guillaume Tell. Last season, Rowley sang a trio of European performances as Leonora in Il trovatore at Opéra de Lille, Théâtre de Caen in France, and Grand Théâtre de Luxembourg; the title role in Tosca at New Orleans Opera; Tove in Schönberg’s Gurre-Lieder with the Orquestra Sinfônica do Estado de São Paulo (OSESP); and returned to The Metropolitan Opera for Bartlett Sher’s new production of Otello. Additional recent engagements included débuts as Musetta in La bohème at the Royal Opera House, Covent Garden, Leonora in Il trovatore at the West Australian Opera in Perth, and the title role of Tosca at the Semperoper Dresden. Her swift ascent to stardom began when she burst onto the international scene as a last minute replacement in the title role of Donizetti’s Maria di Rohan at the Caramoor Music Festival. Of the performance, which she gave with just one day’s notice and one rehearsal, The New York Times stated, “Throughout, she sang with a fluid, darkly rich voice and expressively conveyed Maria’s anguish,” and Opera News noted that she “emerge(d) not just unscathed, but a real star...” She followed that performance with critically acclaimed successes at the Norwegian National Opera as Musetta (released on DVD), as well as Finland’s Savonlinna Festival as Donna Anna in Don Giovanni. Ms. Rowley made her Carnegie Hall début singing Verdi’s Messa da Requiem with the St. Cecilia Chorus and Orchestra, followed by acclaimed performances at New York City Opera and the Savonlinna Opera Festival. She made her début at Alice Tully Hall that fall, and was a featured guest soloist on the 10th Anniversary Gala with Opera Hong Kong. In 2013, she joined the roster of the Metropolitan Opera where she covered Desdemona in Otello, before making her much lauded début at the Spoleto Festival USA, setting the festival ablaze with an impressive double bill performing Anna in Puccini’s Le Villi and Carmela in Giordano’s Mese mariano. Ms. Rowley is a highly-decorated soprano and has been recognized by many international competitions. She was awarded the 2012 Richard Tucker Career Grant, was one of the top prize winners in the 2013 Licia Albanese Puccini Foundation Competition and the 2011 Opera Index Vocal Competition, a winner of the 2011 William Mattheus Sullivan Musical Foundation awards, a first prize winner of the 2011 Gerda Lissner Foundation International Vocal Competition, a grant winner of the 2011 Licia Albanese-Puccini Foundation Competition, and the winner of the 2010 Metropolitan Opera National Council Auditions for the Michigan District. Ms. Rowley made her professional début in Cleveland Opera’s Die Zauberflöte, conducted by Anton Coppola. As a young artist, she worked with the Scuola dell’Opera Italiana at the Teatro Comunale di Bologna where she made her main stage début as Magda in La rondine, The Opera Theatre of St. Louis, the Caramoor Music Festival, Brevard Music Center, the Instituto Superior del Arte of the Teatro Colón, and regionally at Michigan Opera Theatre.